DZI | Sana Ako si Ricky Lee! One of the first few posts that I’ve written about is – FENG SHUI TIPS TO ENHANCE WEALTH LUCK. Today, allow me to share a few more. RECEIPTS IN THE WALLET/POCKET CREATE BAD MONEY FENG SHUI. Most of us tend to keep receipts in our wallet or pocket and just forget about it. In fact, it is not surprising that some of us may have some receipts in our wallet that’s been there for months or years. However, you should note that keeping a receipt in your wallet or pocket might create slight bad money Feng Shui. It signifies that you always have bills to pay. SALT IN THE WALLET. Another way of creating good wealth luck is to always have a small packet of sea or rock salt in our wallet. Salt is a great chi cleanser, and having this in our pocket helps enhance wealth/money luck. PUT A WEALTH SIGN OR WEALTH SYMBOL AS WALLPAPER ON YOUR MOBILE PHONE. Feng Shui is all about symbolism, and putting a symbol of wealth as a wallpaper of your mobile phone helps a little in giving our wealth luck a little boost. You can use either of the following: three legged toad, pictures of gold bars, gold ingots and/or different currencies. PUT THE WISH FULFILLING MANTRA AS WALLPAPER ON YOUR MOBILE PHONE. I’ve talked about the WISH FULFILLING MANTRA and the power of MANTRA in my previous posts. Putting the symbolic script of the Wish Fulfilling Mantra on your mobile phone helps in actualizing your wealth luck wishes. WEAR A NINE-EYE DZI BEAD. A DZI bead is a special Tibetan bead that is suppose to have come from heaven. The DZI beads available in the market now are not original but they work as well. Wearing a 9-eye DZI bead either as a pendant or as a bracelet creates a lot of wealth luck. 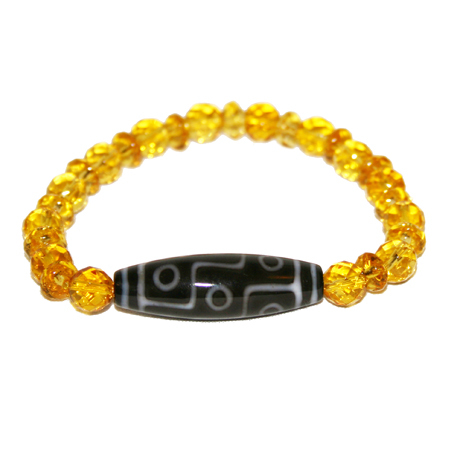 WEAR A CITRINE BRACELET ON YOUR RECEIVING HAND. Citrine is a powerful wealth stone. It can be worn as a pendant but wearing it as bracelet is better. You should wear it on your receiving hand and not on your giving hand. Your dominant hand, meaning the hand that you use to write is the dominant hand, and thus it is your giving hand, the other hand is your receiving hand.